Metroid Fusion (AKA メトロイドフュージョン Metoroido Fyūjon in Japan) is a side-scrolling adventure platformer developed and published by Nintendo for the GBA console in 2002. It was followed by Metroid: Zero Mission. 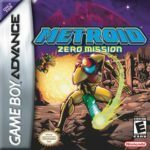 After the phenomenal SNES predecessor, Metroid Fusion on Game Boy Advance (GBA) was released. After almost 8 years, it has remained a great retro video game today with well-paced, atmospheric gameplay. The main character is Samus Aran, a fabled bounty hunter who combats the Space Pirates. Aran aims to obliterate the Metroids, the organic weapons of the Space Pirates. He travels with scientists to the Metroid home-world called SR388. They planned to study the planet but surprisingly hooked by X Parasite, a deadly organism. When Aran lost consciousness and crashed the ship while returning from the Metroid, she escaped the impact safely. However, she was attacked by the X Parasites, including her equipment. That led to a slim chance of survival. Her Power Suit was surgically removed while the scientists injected cells, which came from the Metroids, to her body. It saved her from death yet it drastically changed her appearance. Aran was given some time to recover but during her recuperation inside the laboratory, there was a blast. She was tasked to investigate the cryptic space station. Metroid Fusion’s gameplay has been improved to become a better version of the past instalments. Aran still uses her signature move called spinning jumps. She is also equipped with 8-directional movements to climb surfaces and grab ledges. There are environmental obstacles to overcome, and she needs conquering techniques and power-ups to survive. The overall gaming experience of Metroid Fusion is high in thrill and suspense. So if you’re the type of gamer who wants that, this is the perfect retro GBA video game for you. The main challenge is Aran’s doppelganger who emerged after her Power Suit was infected. Ready to play Metroid Fusion Online? The moody environments with fantastic colors make this game a masterpiece to behold. The areas are varied and display fusion of mechanical and organic design. Metroid Fusion is a difficult game to play. You need to follow the story so that you can understand what techniques to use. For completionists, there are hidden items and power-ups to collect. These collectibles are fiendishly hidden around the environments. Therefore, you need keen attention and wit to uncover these gems. Overall, it’s an exciting experience to play the role of Samus Aran. Metroid Fusion game has been ported to Game Boy Advance (this version) and Virtual Console.